It’s been a pretty good year for Backblaze. The company that started out as a personal and business backup solution has pivoted in January to include offering cloud storage solutions and has been doing quite well with it, storing over 250 terabytes worth of user data. The service, B2, started as a beta in 2015 and released in January to good review, thanks in part to its reliability and low price point. The service can be had for cheaper than almost any other option, including Amazon Web Services and Microsoft’s Azure. When asked about B2, what they learned from the beta and early launch, and who it could be utilized by, Gleb Budman, CEO and co-founder of Backblaze is quoted as saying, “We learned there are an insanely broad set of use cases people and companies intend for B2, but found a few large common areas including LTO (Linear Tape Storage) tape replacement/augmentation, server and NAS backup, and the ability to transparently expand internal company storage. Also, we received a lot of usage feedback that helped us test the system, improve performance, and more.” Much of that feedback and testing came during the beta and open beta stages, helping Backblaze have their full launch without so much as a hitch. But in the grand scheme, Backblaze is still a small company in this space, especially considering what you see coming from the likes of Amazon, Microsoft, and Google, but that isn’t going to stop them from continuing to grow and be competitive. “We intend to keep offering an incredibly low-cost offering as a key benefit for customers. However, we also are a very open company, sharing everything from the design of our Storage Pods to the reliability statistics of the hard drives we use. Additionally, we are actively working with partners to build the ecosystem surrounding Backblaze B2 to make it easy for customers to use the service through a variety of products such as Synology, CloudBerry, and more,” states Budman. Those storage pods mentioned have seen quite an improvement in the past year, as well, with multiple iterations being released in an effort to improve everything from cooling, to amount of storage, to physical space/storage space ratio. Combine that with their recent upgrade to HDDs to provide even greater amounts of storage per pod, with lower failure rates, and you have a recipe for a solid, reliable storage system. When all of these things come together, it’s easy to see why the company is excited about their future. With data holding numbers already half those of established, big player, Dropbox, Backblaze continues to blaze their way through the ranks. 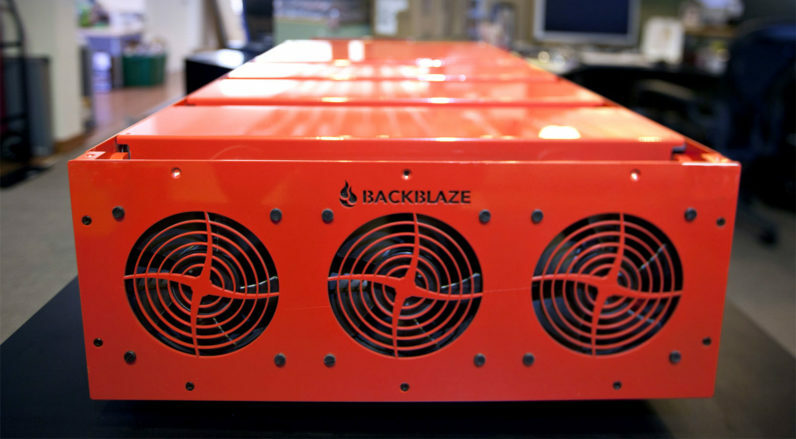 By continuing to improve on all the pieces, from pod to product, Backblaze has no plans on not being competitive going forward and it will be exciting to see what they come up with in the next 12 months.